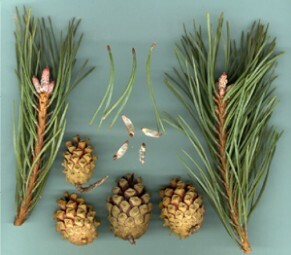 Pine Oil is used in Natural Skin Care Products for its Penetrating and Invigorating Properties. Pine, also known as Scots pine is found in the cold upland regions of Europe, Scandinavia and the USSR and is indigenous to these area. The parts used are the buds, the thick distilled resin of the tree and the essential oil obtained by steam distillation of the needles. One of the more well recognised members of the conifer family (Coniferae) is the White Pine - the northern hemisphere Christmas Tree. The pine needles contain the greater proportion of essential oil that is extracted by dry distillation. This essential oil is penetrating, invigorating and exhilarating. Pine is an excellent general tonic to the entire body. It is said to improve sluggish circulation, relieve muscular pain and is beneficial against infections of the lungs, urinary system and sinuses. When used in Massage and Bath oil blends, Pine oil relieves anxiety, stress and nervous tension. The crisp fragrance of Pine clears and relaxes the mind. Inhaled as steam, pine oil is of benefit in the treatment of coughs, laryngitis, chronic bronchitis, catarrh, asthma and other respiratory diseases since it exerts dilatatory action on the bronchi. 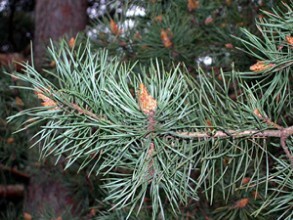 Pine oil may be taken internally in small doses in the form of lozengers, syrups, or on suger. Wildcrafted Invigorating Hydro Oil Blend. 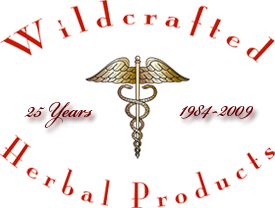 Contraindications and Cautions: May be irritating to sensitive skin types.